Jennie-O’s Ground Turkey, Italian Turkey Sausage, and All Natural Turkey Breast Tenderloins are all staples at our house, especially when we’re in Healthy Living mode…which is probably in order more often than not :) I originally made this Turkey Piccata recipe a couple years ago when I was a die-hard Weight Watchers girl. This dish has no lack of flavor but by simply exercising portion control AND measuring the added fats (as in measuring spoon) it can be a very figure friendly meal. Piccata by definition is meat that has been thin sliced, or pounded thin, coated, sautéed, and served with a pan sauce. It’s as simple as that to make and can easily be prepped and ready for the sauté pan ahead of time, making it a wonderful dish for entertaining. 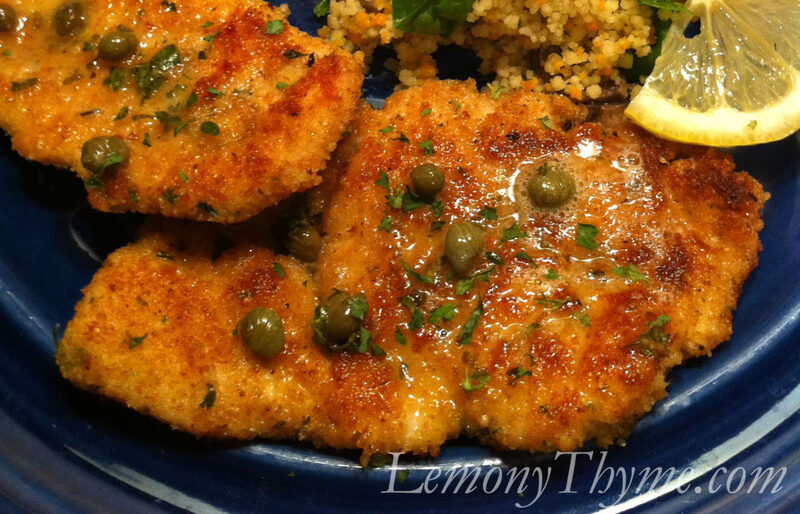 With the lovely lemon caper wine sauce, Turkey Piccata loves to be served with a side of Mushroom, Spinach & Herb Couscous. Pound turkey pieces to ¼” thickness (between plastic wrap). Dip pieces in egg white then dredge in bread crumbs. Chill before cooking to set crumbs. Spray sauté pan with cooking spray and add just enough olive oil to coat pan. Brown over med heat (keep in warm oven while making sauce). Wipe out any crumbs from sauté pan, then bring ingredients to gentle boil for 1 minute. Place two turkey piccata pieces on each plate, with serving of couscous. Spoon sauce over turkey. Serve with lemon slices. Mmmm…you have some delicious looking recipes here! I’m glad to have found you! Yum! Thanks Betsy! Glad I’ve found you too.